Zak's Safari is a book about donor-conceived kids of two-mom families. When the rain spoils Zak's plan for a safari adventure, he invites the reader on a very special tour of his family instead. Zak shows us how his parents met, fell in love, and wanted more than anything to have a baby--so they decided to make one. 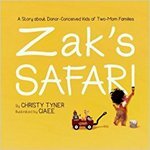 Tyner, Christy, "Zak's Safari: A Story About Donor-Conceived Kids of Two-Mom Families" (2014). DIVerse Families. 336.